Eight little ducklings are safe, thanks to the quick and careful work of D.C.'s first responders. Eight little ducklings are safe thanks to the careful work of D.C.’s Fire and EMS. The ducklings fell in a storm drain at the intersection Monday afternoon between 12 Street and Main Avenue in southwest Washington. The mother duck was standing close by as rescue workers used nets to lift the ducklings out of the storm drain. 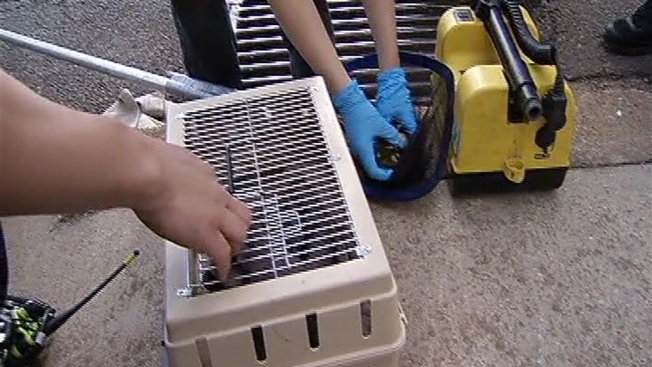 D.C.’s Fire and EMS, Animal Care and Control, Water and Sewer Authority and Metropolitan Police Department were all on scene to help rescue the ducklings. The rescue team tried remove the drain cover at around 4:25 p.m., according to a tweet from DC Fire and EMS. The cover was not removed, so the rescuers used the nets, according to video posted on Twitter. All ducklings were lifted from the storm drain safely and were reunited with their mother by 5:04 p.m. It wasn't the only duckling rescue of the day across the East Coast. In New York's Long Island, authorities teamed up to rescue nine ducklings that toppled into another storm drain, NBC 4 New York reported.